Pick ‘Til You Win … At The Golf Course! Looking to hold a contest or promotion at your upcoming fundraising golf tournament? Looking for something unique…. something other than a hole-in-one or putting contest that will draw players to your event? Thanks to Hole In One International’s sister company, Odds On Promotions, we’ve got just the promotion for you — a Pick ‘Til You Win lucky envelopes promotion! Here’s how it works: Advertise up to a $1,000,000 prize and have all of your players enter a qualifier of some sort. This can be anything from a golf contest (longest drive, straightest drive, closest to the hole, etc.) to a simple raffle. 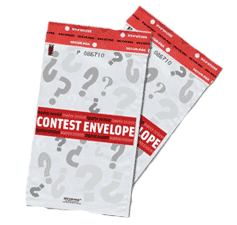 Using Odds On’s “lucky envelopes”, have your finalists open one envelope at a time, revealing one of the three different prize values. The first prize selected five times is the one they walk away with… and Odds On will pay for the prize! Keep in mind: Odds On can also customize your inserts to display golf-related graphics! For example, when opening up the envelope, instead of merely seeing “$20,000” displayed in black text on the insert, you could have a golf course background and display the prize amount in a golf font comprised of golf balls to make them stand out! The possibilities are endless. Give Odds On Promotions a call at 888-827-2249 for a free, no-obligation quote and further information. Let us know what you’re looking for… or, if you’re not sure, let one of our experienced promotions specialists help you out with some great ideas! You can also reach Odds On by email as well, if you’d prefer! Home » Blog » Pick ‘Til You Win … At The Golf Course!